Your personal opinion on Sunda says a lot about who you are as a person. Let us explain. Sunda is the fancy "New Asian" cuisine brought to you by the same guys as Rockit and Underground. It's relevant to know they own Underground because it explains why Sunda is the dining equivalent of popping bottles. If you like to hang with the beautiful people who run the River North scene, then you probably love to See and Be Seen at Sunda. And it's for this reason we don't often think about eating here, because a lot of the time it's just too much to handle, from the people to the price. But here's the thing. Every time we have a reason to go back to Sunda, or for whatever reason it just happens, we are reminded that the food is really good. The menu consists of a lot of familiar dishes and ingredients associated with Asian cuisine, but Sunda prepares it all impeccably well and in modern fashion. There's really nothing to eat here that we don't like, although we try to keep it to things that are practical for sharing (no pho). Other than that we recommend mixing it up, sushi included. This probably isn't the kind of place you want to eat at on a regular basis, but the food itself is good enough to bring you in the door, even if the fabulous life isn’t your thing. Unless you like the ChampagnePapi lifestyle, our suggestion is to avoid the weekends, and probably Thursday nights too. And if Sunda feels like home to you, ain't nothing wrong with that either - good eats are good eats. Don’t hate on quintessential Americanized sushi rolls. Nobody ever said they didn't like a little shrimp tempura, spicy tuna, unagi, jalapeno, and avocado rolled up together with tempura crispies over the top. A spicy tuna roll, and a pretty good one. A standard rainbow roll with quality fish. In a world filled with too many brussels sprouts salads, the awesome flavor of this dish is the most basic edible explanation proving why Sunda is so good. Choice of pork belly or duck, or do what we like to do and get both. Can never have too many steamed buns in life. Roast duck, fried egg, scallions, frisee, mushrooms, bok choy, and crispy duck skin. A well cooked fried rice with a lot of flavor. The signature cod with eggplant and sweet miso. A basic fish with anything but basic flavor. This is delicate and perfect, and the miso adds just the right amount of sweetness. You can order full fledged pieces of meat like bone-in pork chop, wagyu ribeye, and filet, but they also come with full fledged price tags. We don’t usually go heavy on the red meat at Sunda, but these lemongrass, ginger citrus, and sweet soy glaze meat lollipops satisfy the carnivore quota. Ēma is a small plates Mediterranean restaurant in River North, and it’s good for a lot of occasions. 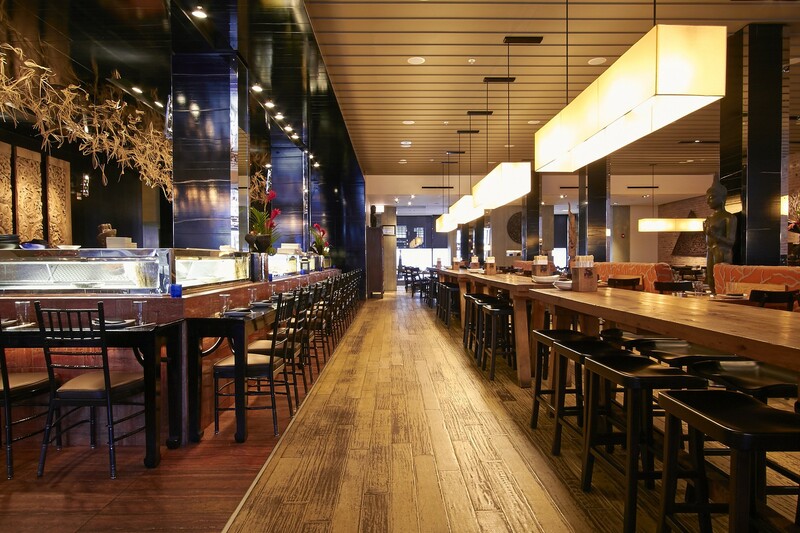 Radio Anago is a sushi spot in River North from the same people who own Bavette’s and Au Cheval.